Michael Polanyi, the philosopher, economist and physical chemist said, “I shall reconsider human knowledge by starting from the fact that we can know more than we can tell”. Michael is referring to tacit knowledge which he describes as the type of knowing that is difficult to transfer to another person by means of writing it down or verbalising it. Dr Hubert van Doorn, Supervisor and Practice Medical Educator with NTGPE realised he was working in a GP supervisor setting that relied on tacit knowing and wanted to explore the influence of this type of knowledge when training GP registrars. “I realised after many years working in the same GP practice that I’d developed a form of knowing that operated without a lot of deliberate cognitive effort. This became more obvious when I needed to share the rationale behind making clinical decisions when consulting alongside GP registrars”. Trying to find a way with language, to describe a phenomenon that is silent, has challenged Hubert enough to consult the academic community. This lead to developing a research proposal as a prospective master candidate at the Prideaux Centre in Flinders University. “Dr Julie Ash and Professor David Giles are educational academics from the university, and encouraged me to visit educational researchers in Canada to develop ideas and direction for my own research”. 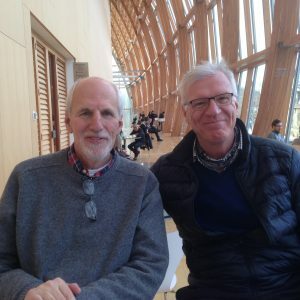 In December 2017 Hubert travelled to Canada and with the help of Dr Warren Rubenstein and Professor Michael Kidd had meetings in Toronto relating to his research proposal. These were at the Department of Family Medicine, the Wilson Centre – which aims to advance healthcare education and practice through research, and the Mt Sinai Hospital in Toronto. Before coming to Toronto Hubert met with three senior researchers at the Centre for Health Education Scholarship (CHES) at the University of British Colombia in Vancouver. “These discussions validated the academic literature that expertise can be enacted in an unconsciously competent or tacit manner. The relevance to GP supervisors is to find a way of describing and sharing this important form of knowing, that isn’t expressed linguistically. The goal, perhaps put simply, is to find ways of sharing the experiential wisdom with our GP registrar colleagues. Hubert returned to Australia encouraged from the people he met to formalise and refine a research question for his Master of Clinical Education on the nature of tacit knowing experienced by GP supervisors. “The research methodology will be hermeneutic phenomenology, which sounds very complicated, but it is a method of collecting stories of experiences relevant to the research question and interpreting them. The plan is to enlist GP supervisors to share experiences of supervising GP registrars and knowing what is going on, but not being able to put this into words”.